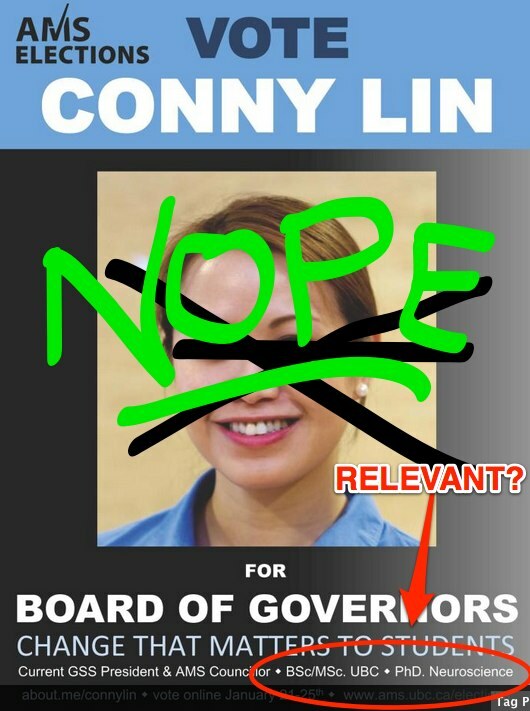 Conny Lin was recently fined $200 by the Elections Administrator for sending an email while wearing her GSS president hat in which she endorsed herself on behalf of the organization of which she is president. Such shameless self-promotion or clueless disregard for conflict of interest isn’t grounds for disendorsement per se, since utter shamelessness is a prerequisite for running in UBC elections. She then sent out a third email, which News Guy Will McDonald delicately worded as “revoking her endorsement from the GSS.” DISENDORSED. *This is how I imagine the IFC’s endorsement process goes. This entry was posted in AMS Elections, Disendorsed on January 22, 2013 by queigh.